The Goliath Palm Cockatoo is perhaps the only parrot in the world that uses tools! During courtship the males and females will grasp sticks and beat them against hollow logs, like a drum. This is unique to the Palm Cockatoo and helps to distinguish them from the Black Cockatoo. The Goliath Palm Cockatoo is not common in captivity. This may be due to the fact that they are quite difficult to breed in captivity, and when they are bred in captivity they are usually left in breeding programs to help increase their populations, as they are an endangered species. Because of its endangered status, the Goliath Palm Cockatoo is no longer imported and can only be obtained from domestic breeding programs. 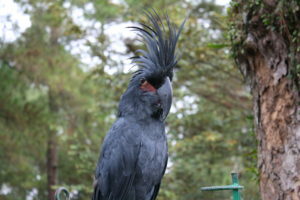 They are reported to have quite different personalities than white cockatoos and are generally not seen as pets. Those who have kept them in captivity report that they are usually shy and quite gentle, especially considering their size. They are also not easy to keep in captivity, and most recommend that be kept in captivity only for breeding programs to increase their populations. The Goliath Palm Cockatoo may well be one of the most expensive parrots in the world. 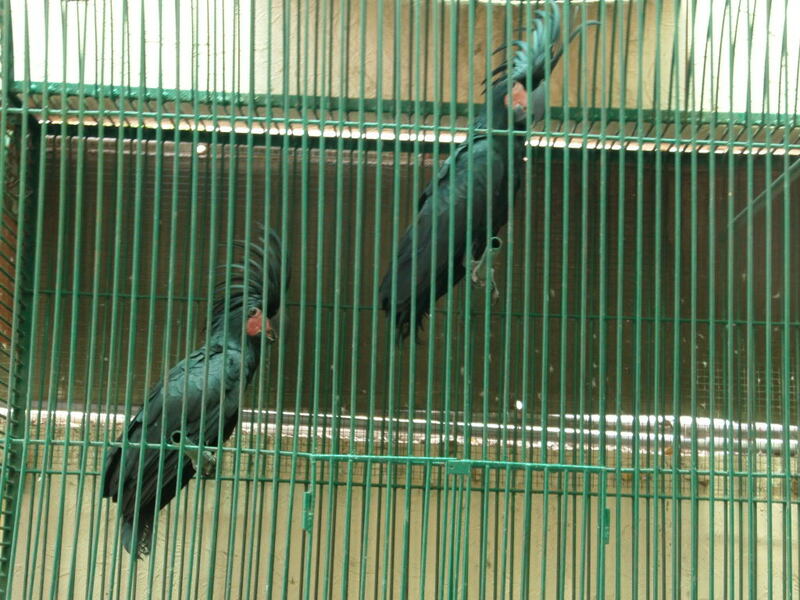 They sell for more than the Hyacinth Macaw in most regions. Unlike many other parrot species, Palm Cockatoos are slow risers and are not very active in the morning. The Goliath Palm Cockatoo is an intelligent parrot. They are also quite active and aggressive chewers. They should be given plenty of chew toys and branches to keep them satisfied. The Goliath Palm Cockatoo is one of the most striking parrots in the world. In addition to their impressive size, their unusual coloring and regal crest make them incredible to behold. It is unusual for a cockatoo because it has grayish-black plumage and red cheeks. Their cheeks may become even redder looking when they get excited. This parrot is very similar in appearance to the Palm Cockatoo (P. a. aterrimus), but it is considerably larger, averaging 27 inches (68 centimeters) at maturity. Their wingspans are equally impressive, measuring 14 to 15.9 inches (35.5 to 40.5 centimeters). Their erect crest is quite beautiful, consisting of curved backward rising feathers. They have dark brown eyes and red tipped black tongues. They also have very large bills, which are much larger than most cockatoos. It almost resembles the bill of a large macaw. Males and females are similar in appearance, except the female has a shorter upper mandible than the male. The upper mandible is also the best way to distinguish juveniles from adults. In the immature individuals it is pale, while in adults it is black. 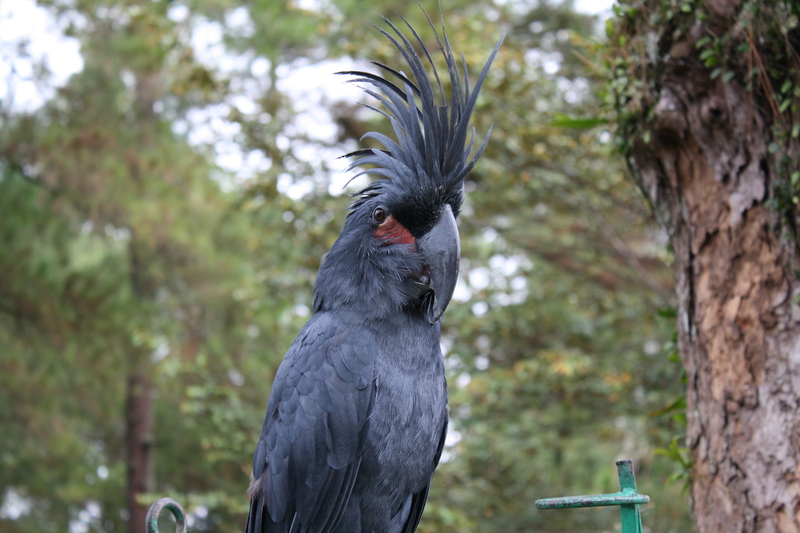 The Goliath Palm Cockatoo is native to New Guinea and the western Papuan Islands, with the exception of Misool. They are well adapted to the tropical rainforest habitat. This is not the case for all other Cockatoo species, which prefer dry habitats. In the wild, Goliath Palm Cockatoos roost and nest in large trees. These trees are a requirement for all Palm Cockatoo subspecies. Unfortunately, the Goliath Palm Cockatoo is highly endangered in the wild. With luck, captive breeding problems will help to increase their rapidly declining populations. The Goliath Palm Cockatoo has a more specialized diet than many of the other parrot species. In addition to the varied diet recommended (pellets, fruits, nuts, berries, etc.) for other hook-billed parrots, they also require Kamani and Pandanus nuts. 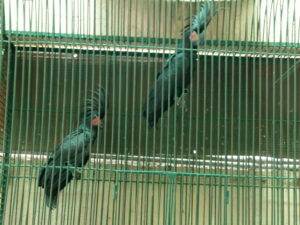 Some Goliath Palm Cockatoos may refuse to eat at all in captivity. This is one reason they are so difficult to keep. 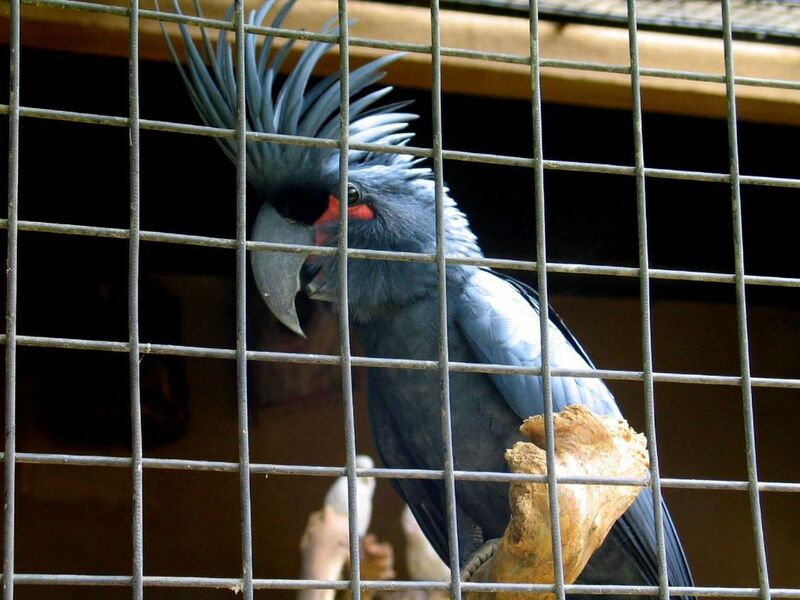 The Goliath Palm Cockatoo is very difficult to breed in captivity. If breeding is successful, they only lay one egg. The single egg incubates for approximately one month, though it may take a little longer. Breeding pairs should be left alone, as they are highly sensitive to disturbance. Avoid any changes in their aviary or surroundings. In the wild the magnificent Goliath Palm Cockatoo will use existing nesting hollows of other birds. Remarkably, the fledgling period lasts 100 to 110 days. This is longer than any other parrot species.